In a small bowl, combine ¼ cup warm water, yeast, and 1 teaspoon sugar. Let stand for 5 minutes or until foamy. In a large bowl, beat remaining 3 tablespoons sugar, shortening, and salt at medium speed with a mixer until smooth. Add ½ cup boiling water and evaporated milk, beating until combined. Add egg, beating until smooth. Stir in yeast mixture. On alightly floured surface, turn out dough, and knead for 6 to 8 minutes or until dough is smooth and elastic. Place dough in a lightly greased bowl, turning to grease top. Cover and chill for at least 30 minutes or upt o 2 hours. On a lightly floured surface, roll dough to ¼ inch round cutter, cut dough. Do not reroll dough. In a large dutch oven, pour oil to a depth of 3 inches; heat to 350 degree over medium heat. Fry dough in batches, turning frequently, for 2 to 3 minutes or until golden brown. Drain on paper towels. Sift confctioners sugar over hot beignets. 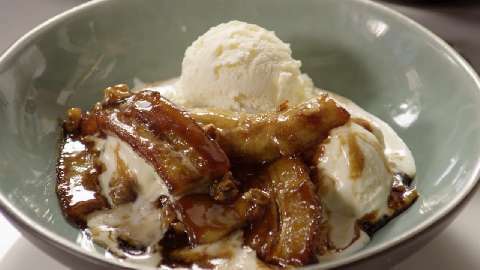 Serve warm with Bananas Foster Sauce. In a large skillet, melt butter over medium heat. Add brown sugar and cinnamon, stirring until sugar dissolves. Remove pan from heat, and slowly stir in rum. Return pan to heat, and cook for 2 to 3 minutes or until mixture thickens slightly. Add banana slices, and cook for 1 minutes longer. End.